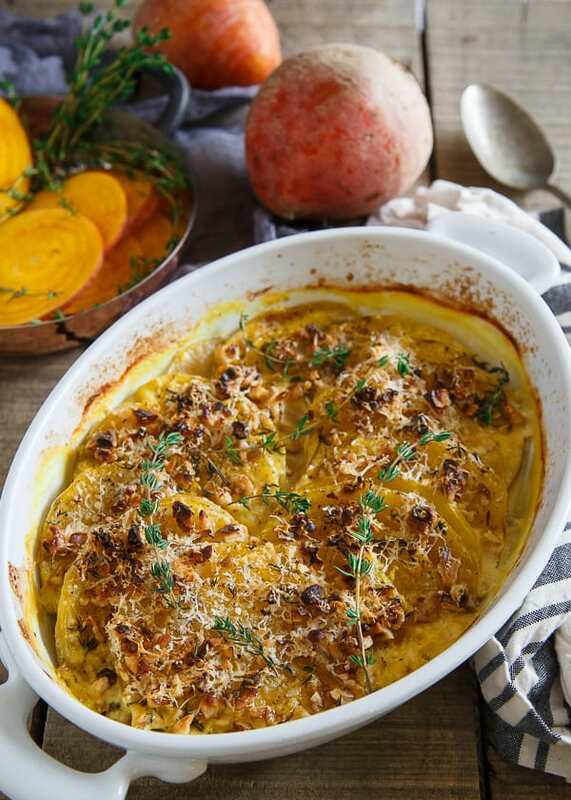 This golden beet gratin is made with gorgeous orange beets, coconut milk, chopped walnuts, parmesan cheese and thyme for a decadent yet healthier side dish option perfect for your holiday table. I’m sitting in a hotel lobby in the middle of Paris. Today is our last day in the city, a day we intended to spend sightseeing things like the view from Sacre Coeur at night, The Louvre, lunch at a famous creperie, a walk down the Champs Elysees, things tourists do. We were lucky to be at an organized event on behalf of Cono Sur, the wine brand Julie won this trip through, on a dinner boat cruise in the middle of the Seine, probably the safest place we could’ve been in Paris on Friday night but just a couple of hours prior, we were walking the Parisian streets like everyone else, completely unaware of what was to come. Driving home from the boat in a taxi at 1am literally right through the area of the concert hall and restaurant shootings was surreal. Closed streets in every direction, armed military and police on every corner, crowds of people, sirens, so many sirens, the fear while you’re stopped at a red light that someone might just start shooting into your car because your mind is wandering in crazy directions. The mood as I write this (Saturday afternoon) in Paris is tense and somber. There are people outside, but far fewer than normal. Shops, museums and many public places are closed. As a foreigner, our short walk around the corner to the market to get some food today was nerve-wracking and filled me with a sort of anxiousness I honestly haven’t felt since the sunny September morning I walked back from Econ 201 in 2001 to my college roommate hanging out of the window screaming that one of the Twin Towers had just collapsed. I’m a rational, pretty calm-natured person in tense situations but this, it kind of just rattles you to your core. So we’re holed up in our hotel, passing hours doing work and just waiting to fly home tomorrow, praying our flights actually leave as scheduled. 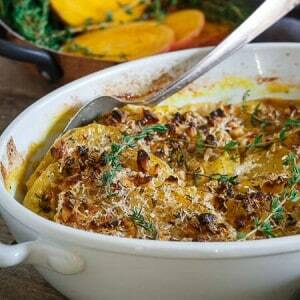 I honestly don’t know what to say about this golden beet gratin. I had planned on talking about how great it’d be on your Thanksgiving table but it seems weird to talk about a holiday based around things we’re thankful for in light of the terrible events that took place in this city just last night. As families come together in 10 or so days on our American holiday of thanks with an impressive display of comforting dishes to choose from, I hope you take a minute to think about the people of Paris whose holiday season was just turned upside down in the worst way possible. Arrange sliced beets in a circular pattern in a baking dish. Combine coconut milk, garlic, salt, pepper and thyme in a small bowl and heat in the microwave (alternatively in a small sauce pot on the stove) until just warmed and fragrant. Pour milk mixture over the beets in the baking dish and cover with aluminum foil. Remove foil, top beets with chopped walnuts and parmesan cheese and bake uncovered for another 15-20 minutes until nuts are golden brown and toasted on top. Remove from oven, garnish with additional thyme and let sit 5-10 minutes before serving. SO glad you guys are safe! I can’t even begin to imagine what you guys were going through in those moments and days after it all happened. I can only imagine how scary your trip was. I was out of town with a girlfriend and we both mentioned how scary it would have been to be in Pairs. Glad you are safe. 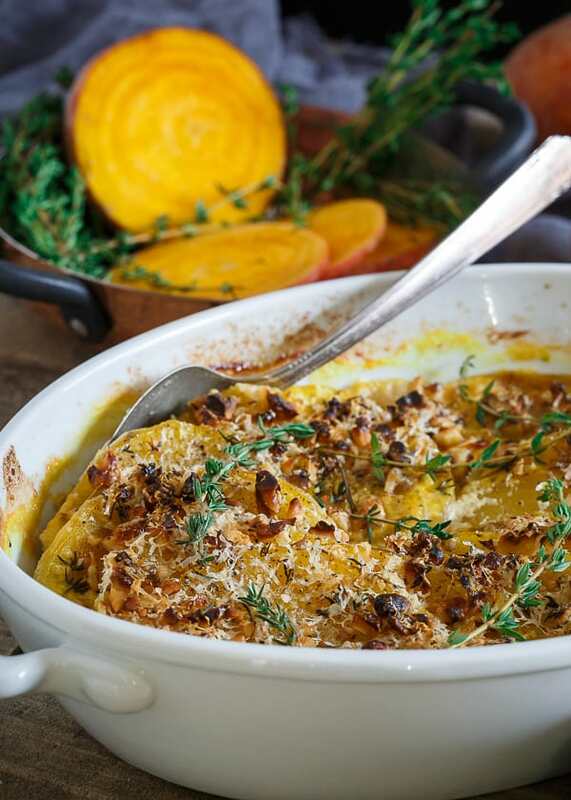 Your beet gratin is gorgeous, I love using golden beets they make such a great presentation. As soon as I heard about the attacks, I went to FB to make sure you were okay. I am so glad that you and Julie were unharmed, and I cannot even imagine how terrifying that cab ride was. I am sure your life will forever be changed. You’re right talking about beets does seem insignificant, but your point that we take time to think of the Parisians is a good one. And taking the time to be thankful for all that we have as well! God speed my friend. paris is my home away from home and I still cannot quite comprehend what took place. The horror, the cruelty. Thanksgiving right at the corner, we do have a lot to be grateful for. 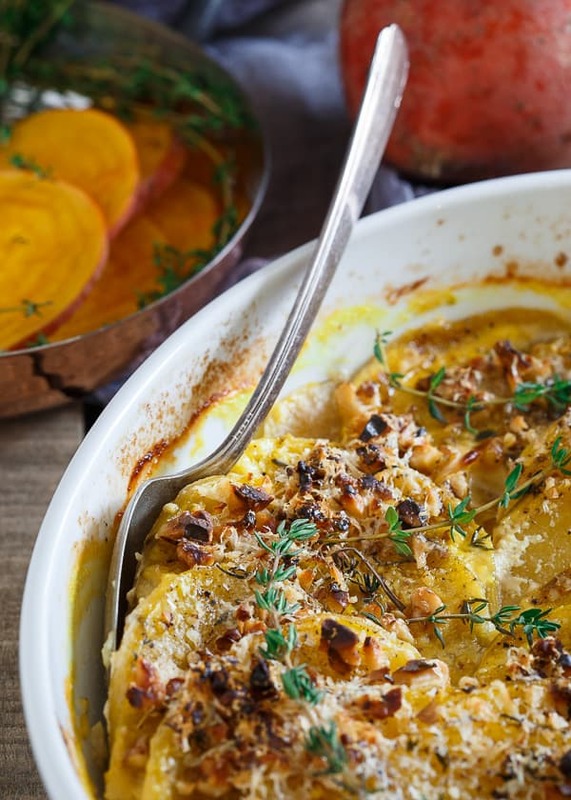 This beet dish looks amazing – I have been meaning to cook something up with golden beets I’ve seen at the farmers market lately. But more importantly, I am SO glad you are ok. I can’t imagine how it must have felt to have been there. My prayers are with everyone in Paris and those affected. I think you wrote this perfectly.. we are blessed to be spending time with our families this holiday season. Oh my gosh, Gina, I had no clue that you were in Paris on Friday! I’m glad that you and Julie were safe, and I do hope that you have/had a safe journey home. I have no words for what happened either, but I just know that I’ll be thankful to have all my friends and family around come Thanksgiving. My daughter loves beets! I’ll have to make this for her. I’m so, so glad you both are safe. We have so much to be thankful. It actually was 1 beet as it was a huge one and when thinly sliced, it filled up the whole casserole dish. That said, use however many you need once sliced to fill a casserole dish about the same size when layered in the same fashion. About how large (heavy) is one beet for you? About 170 grams or 6 ounces according to the Internet, yes? Just checking. Also about how large is your baking dish it looks like an oval about 9 to 10 inches long? (Sorry for all the questions but I like this recipe and want to make it right! And thanks for posting this!!! I don’t have exact measurements for the beet, just use one or more that fills up your baking dish. And yes, I’d guess about an 8-9 inch oval dish. Doesn’t have to be exact, use whatever baking dish you have in that approximate size! Thank you for posting this recipe! I made it but the cheese was absorbed by the beets turning them somewhat darker than in your photo. It was certainly delicious!